Happy Friday, lovelies! I hope you had a fantastic week. 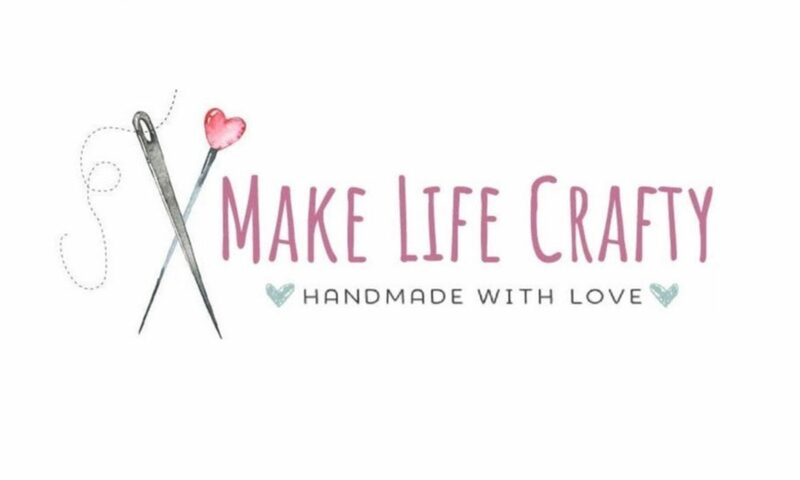 You may have noticed I’ve been MIA here for a little while, and it’s not that I haven’t been sewing but rather I’m making gifts for people and, well, posting them on my blog would ruin the surprise so I’ve been holding off. Today, though, I have a very quick and easy tutorial for you. Actually, a pretty great gift idea with just a very small time commitment. As you know I’ve been de-stashing my sewing room for some time now. I am slowly (but surely!) making my way through many, many meters of fabric that have been sitting uncut for ages. For today’s tutorial I used a heavy, knit chevron print from the stash. I paired it with a bargain bin mustard colored fleece I found at our local Fabricville. In my stash I had exactly 2 meters of the chevron fabric so it was pretty much fate when I came across exactly 2 meters of this fleece. You will see from the “tag”, I snagged the fleece for $7.50 which is a total steal! 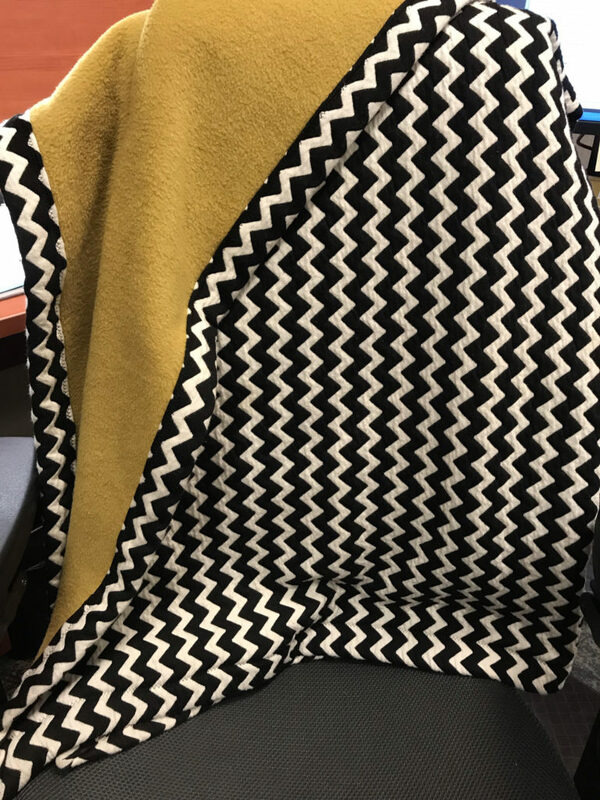 My work colleague and I frequently get cold at the office so I made matching lap quilts. These are totally functional and definitely cute. To start I simply cut 1 meter each of the chevron and fleece. I took the chevron fabric and squared it up using a ruler and cutting wheel. Then I laid the fabric (right side down) on the floor, taped it in place at the corners, and laid the fleece over top, with right side facing up. So now I have the fabric laid flat with wrong sides together. 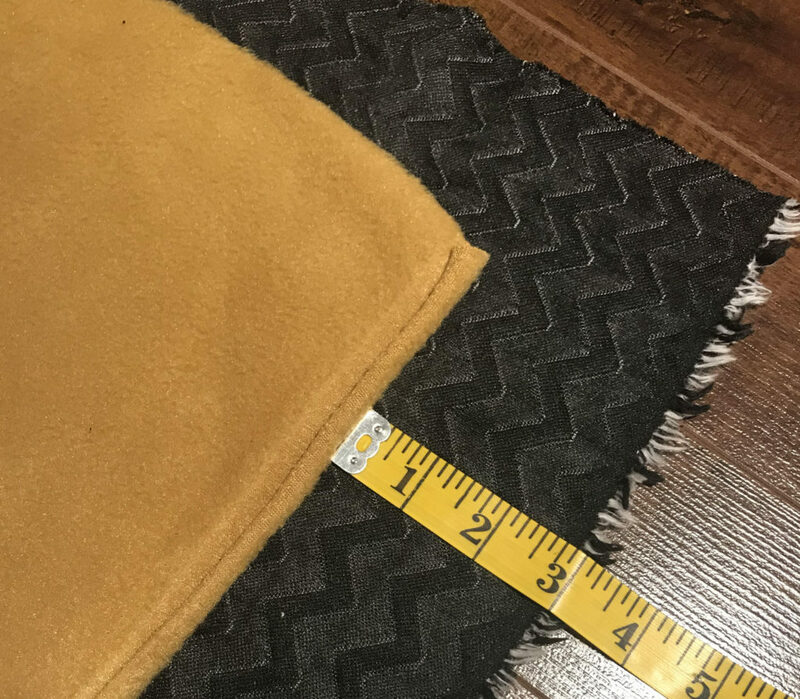 I carefully trimmed the fleece so it rested 3″ inside the edge of the chevron. I wanted a nice, wide binding around the blanket. If you would prefer something more narrow, I would go with 2″. 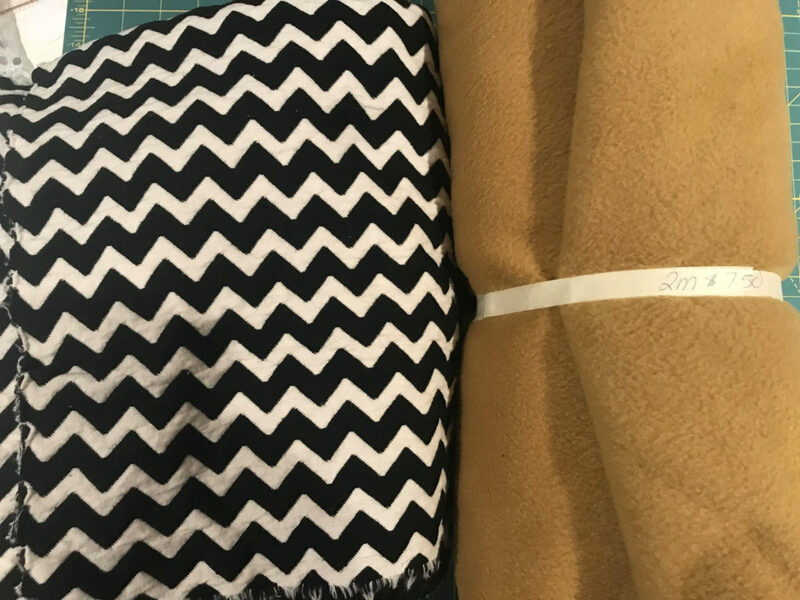 I went along the edge of the blanket, folding the chevron over the raw edge of the fleece, then tucking the fold in a second time so no raw edges were exposed. I used a zig zag stitch for the perimeter of the blanket. Annnnd done! Because there is no batting in the middle of the two fabrics there’s no need to quilt it down or do anything fancy. This is *literally* a project that can be done in 30 minutes.